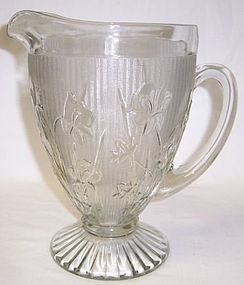 This pretty crystal clear Jennyware Pitcher was made by Jeannette Glass as part of their kitchen ware line. It measures 5 1/2 inches to top of pour spout and is in very good condition with no chips or cracks. We guarantee all items as described. Feel free to email with any questions. THANK YOU. 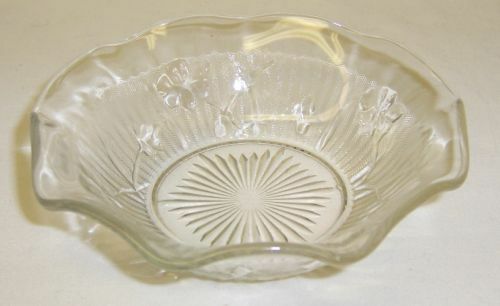 This is a really pretty crystal Iris and Herringbone depression glass 11 inch Straight Sided Bowl made by Jeannette Glass from 1928 to 1932. 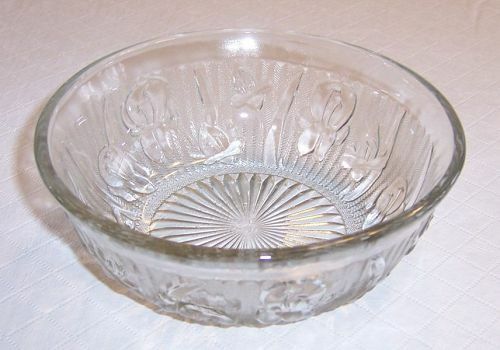 This Bowl is in very good condition with no chips or cracks. Be sure to search our other Iris available. We guarantee all items to be as described. Feel free to email with any questions. THANK YOU. 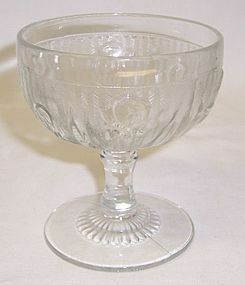 This is a really pretty, vintage, Crystal Iris and Herringbone depression glass Cocktail made by Jeannette Glass from 1928 to 1932. 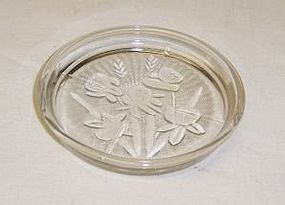 This Cocktail measures 4 1/4 Inches high X 2 1/2 Inches in diameter at the top. This Cocktail holds 4 ounces and is in very good condition with no chips or cracks. Be sure to search our other Iris available. We guarantee all items to be as described. Feel free to email with any questions. THANK YOU. 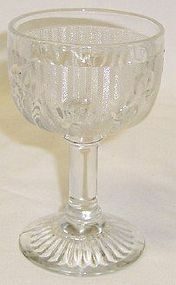 This pretty, vintage, Crystal Iris and Herringbone depression glass 5 1/2 inch Tall Wine Goblet was made by Jeannette Glass from 1928 to 1932. This Wine measures 2 1/4 inches in diameter at the top. It is in very good condition with no chips or cracks. Be sure to search our other Iris available. We guarantee all items to be as described. Feel free to email any questions. THANK YOU. These pretty, vintage, crystal Iris and Herringbone depression glass 6 Inch high Footed Water Tumbler was made by Jeannette Glass from 1928 to 1932 and 1950. This Tumbler is in very good condition with no chips or cracks. Be sure to search our other Iris available. We guarantee all items to be as described. Feel free to email any questions. THANK YOU. This pretty crystal, vintage, Iris and Herringbone depression glass 8 inch Luncheon Plate was made by Jeannette Glass from 1928 to 1932. This Plate is in very good condition with no chips, cracks or scratches. Be sure to search our other Iris items available. We guarantee all items to be as described. Feel free to email with any questions. THANK YOU. This is a pretty pair of Crystal clear Iris and Herringbone Double Branch Candle Sticks made by Jeannette Glass from 1928 to 1932. Both Candle sticks are in very good condition with no chips or cracks. Be sure to search our other Iris available. We guarantee all items to be as described. Feel free to email with any questions. THANK YOU. This is a really pretty set of crystal clear Iris and Herringbone Creamer, Sugar Bowl with Lid, made by Jeannette Glass into the 1930s. This Creamer measures 3 1/2 inches high. 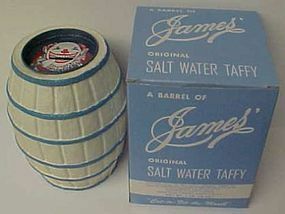 The Sugar Bowl with Lid measures 5 1/4 inches to top of knob. The Creamer, Sugar Bowl bottom and Lid are all in very good condition with no chips or cracks. 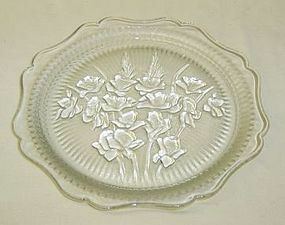 Be sure to search our other Iris and Herringbone depression glass available. We guarantee items to be as described. THANK YOU. 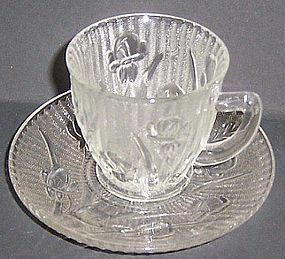 This pretty crystal, Vintage, Iris and Herringbone depression glass Demitasse Cup-only was made by Jeannette Glass from 1928 to 1932. 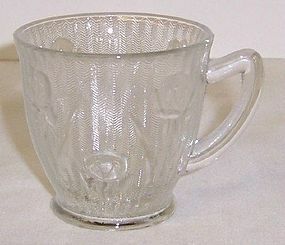 This Demitasse Cup measures 2 3/8 inches in diameter at the top. It is in very good condition with no chips or cracks. Be sure to search our other Iris available. We guarantee all items to be as described. Feel free to email any questions. THANK YOU. This is a really pretty Crystal Iris and Herringbone depression glass 9 1/2 Inch Pitcher made by Jeannette Glass from 1928 to 1932. 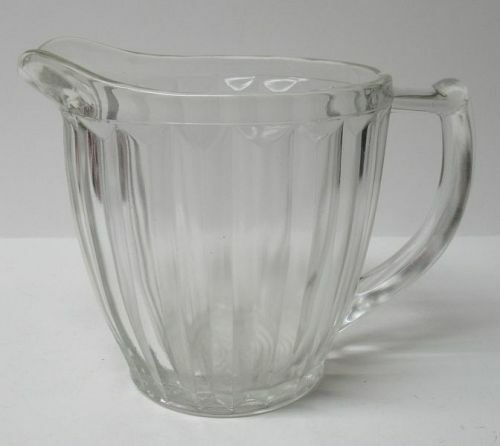 This Pitcher is in very good condition with no chips or cracks. Be sure to search our other Iris available. We guarantee all items to be as described. Feel free to email with any questions. THANK YOU. 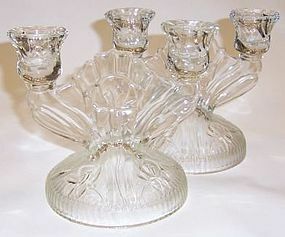 This Crystal Iris and Herringbone depression glass 4 Inch Tall Sherbet is in very good condition with no chips or cracks. 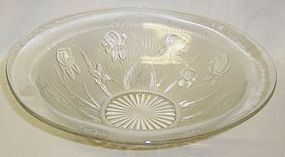 It was made by Jeannette Glass from 1928 to 1932. Be sure to search our other Crystal Iris & Herringbone available. We guarantee all glass to be as described. Feel free to email with any questions. THANK YOU.